This week I have used it as a prompt to help me climb back into the story of David Sinclair, a character from my novella The Game (in the collection Slipping Through), and his current situation in the sequel to The Game - Pool of Players. What is the Jester up to this time? Here's a snippet. David saw it on the floor and picked it up. 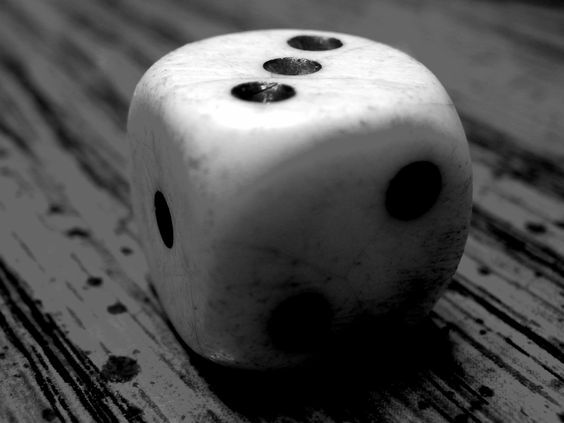 It was a dice – or was it die if there was only one? He thought it might be. The surface was rough and worn. He could see cracks in the white. He tapped it with a finger nail; it was stone. He pondered the person who had left it here. He hadn’t been in this room before, but he had been in the building. That was how he’d been able to get here. He turned the die over in his hand and wondered at its meaning. There was always a meaning, the Jester never left anything by chance and David knew this had to be some kind of clue. He took another look round the room which was devoid of furniture and furnishings: A bare board floor with blank walls and curtain-less windows. Another derelict building; one less worn this time. The Jester seemed to favour them, especially in this city, which seemed to sprawl out in every direction and contain lots of them. They remained hidden behind its facade of uptown glamour. There was no other sign of his elusive adversary, so this was it, the only lead he had to go on. It could only mean one thing; he had to venture into clubs again. The dark dingy ones the Jester liked to frequent in this time parallel were abhorrent, full of dangerous, often psychopathic, men of deviant means. And the die would indicate some kind of gambling den. One came to mind that he had passed a few times, in the back streets when he’d been trying to find somewhere to bunk down for the night. Could he find him there? Or was this another set up? Before David could think further on it, he was there, a few feet away from the entrance. He found this new ability to slip through unnerving, yet exhilarating. Think of a place and just go there. If only he could work out how to do this back home – or to get him back home, but the chances of him seeing it again were slim. He knew too much, the Jester would never let him go back now. And he still had so many questions to ask, he just wanted to find him and ask them. He hated being played like this, again. The die was still in his hand, and it matched the one hanging on the name board above the heavy wooden door, flanked by a bouncer. He was in the right place. What would the Jester have in store for him this time? This is brilliant. I love it! Thanks for joining. I love this so much, but sadly this link is not working, so here is a new link for everyone else - cuz they HAVE to read this it is so good. I have a short one this time called Bones. Excellent, really enjoyed that tale. Great ending. I did say you weren't gonna see this one coming. It's a bit long, but so what? I could have tightened that baby up for you. Fun story. It makes me think of the Kubus Houses cube) they have here in Rotterdam. You can take a tour round one. Mostly Dark FREE for the weekend!